Although we more typically associate camels with the deserts of the Middle East, there are millions of these large-eyed ungulates living in Africa. Most of them are found in North Africa, either in countries like Egypt and Morocco that border the Sahara Desert; or in Horn of Africa nations like Ethiopia and Djibouti. There are three species of camel found worldwide, and the African species is more properly known as the dromedary or Arabian camel. While other camel species have two humps, the dromedary is easily identified by its single hump. Dromedaries have been domesticated for at least 4,000 years, and no longer occur naturally in the wild. Over the last four millennia, they have become indispensable to the people of North Africa. Camels are used for transport, and for their meat, milk, wool, and leather. They are well-adapted to waterless environments and are therefore far better suited to life in the desert than conventional working animals like donkeys and horses. Their resilience made it possible for North African ancestors to establish trade routes across the Sahara Desert, linking West Africa to North Africa. In Somalia, camels have held in such high esteem that the Somali language includes 46 different words for 'camel.' The English word 'camel' is thought to derive from the Arabic word Ǧamāl, which means handsome--and indeed, camels are quite dashing, with their long, slender necks, regal air, and impossibly long eyelashes. Their eyelashes are double-rowed and serve the practical purpose of keeping sand out of the camel's eyes. Camels have several other unique adaptations that make it possible for them to survive in the desert. They are able to control their own body temperature, thereby reducing the amount of water that they lose through sweat. They can close their nostrils at will, which also reduces water loss while helping to keep sand out; and they have an exceptionally fast rate of rehydration. Camels can go as long as 15 days without water. When they do find water, they are capable of drinking up to 20 liters in a single minute; however, contrary to popular belief, they do not store water in their hump. Instead, a camel's hump is made from pure fat, from which its body can draw both water and nutrients as required. The hump also increases the camel's surface area, making it easier to disperse heat. Camels are surprisingly fast, reaching maximum speeds of 40 miles per hour. Camels' ability to withstand extreme temperatures makes them invaluable in the desert, where temperatures soar above 122 F/ 50 C during the day and often fall below freezing at night. Some camels are used for riding, with the help of a saddle that goes over the hump. 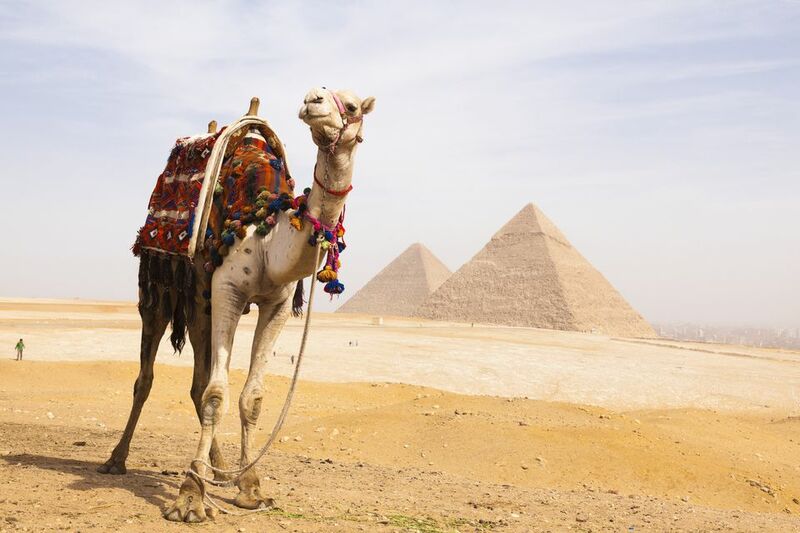 In Egypt, camel-racing is a popular sport. Camel rides are popular for tourists, too, and in many North African countries, camel safaris are a top attraction. Other camels are used primarily as pack animals, to transport goods rather than people. In particular, camels are still used to haul massive blocks of salt from the desert in Mali, and from Djibouti's Lake Assal. However, this is a dying custom, as camels are increasingly being replaced on the salt caravans by 4x4 vehicles. In some countries, camels are even used to pull plows and carts. Camel meat, milk, and sometimes blood are important to many African diets. Camel milk is rich in fat and protein and is a staple for North Africa's nomadic tribes. However, its composition is different from cow's milk, and it is difficult (but not impossible) to make butter. Other dairy products are equally tricky, but camel cheese, yogurt, and even chocolate have all been produced successfully in certain parts of the world. Camel meat is eaten as a delicacy in North and West Africa, rather than as a staple. Typically, camels are slaughtered at a young age, because the meat of older camels is too tough. The meat from the hump is most popular because its high fat content makes it more tender. Raw camel liver and camel stews are also eaten in Africa, while camel burgers are becoming a delicacy in first world countries like the UK and Australia. Camel leather is used to make shoes, saddles, bags, and belts, but is generally considered to be of poor quality. Camel hair, on the other hand, is coveted for its low thermal conductivity, which makes it perfect for producing warm clothing, blankets, and rugs. The camel hair products that we sometimes see in the West typically come from the Bactrian camel, however, which has longer hair than the dromedary. Hey Travelers! Leave the Wild Animals Alone!